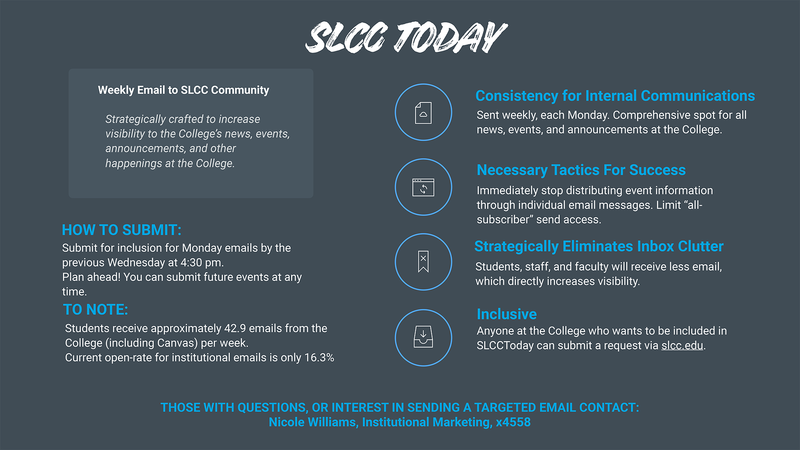 An email sent each Monday to SLCC students, faculty and staff, strategically crafted to increase visibility to the College’s news, events, magazine articles, important announcements, and other happenings at the College. Collaborate and cross-coordinate email communications to more effectively promote happenings at the College. Create a consistent space for faculty, staff, and students to gather information and stay up-to-date with news and events. How can I include my event, news, or announcement in SLCC Today? If you want to submit a story, event or announcement for inclusion in SLCC Today, you can do so by using the email submission form. The submission deadline for SLCC Today is every Wednesday at 4:30 p.m. All information submitted by that time will be considered for inclusion in SLCC Today the following Monday. How can I add my event to the SLCC calendar? If you are hosting a College event, be sure to check out and contribute to the College's comprehensive event calendar. You can create an account and submit any College event for inclusion, or view upcoming events at calendar.slcc.edu. Why are you creating SLCC Today? By using a weekly email, this allows the College to provide information and news to our community in a single, digestible way. It also means more exposure for all happenings at the College and less email in your inbox! Who will still be able to send all-subscriber emails? The President, emergency management, policy changes, facility closures, and other urgent email communications will still be sent via all-subscriber. What if I want to send an email to a specific list or audience? You can! Use the same request tool and email submission form. Or contact Nicole Williams at nicole.williams@slcc.edu. Please note, pulling individual lists may take up to two weeks. How can I promote my SLCC event outside of the calendar and SLCC Today? There is a variety of channels to promote your news or event at SLCC. Contact your IMC Marketing Manager for help and support. If you have questions about SLCC Today, feel free to contact Nicole Williams in Institutional Marketing and Communications at nicole.williams@slcc.edu.